Good strategies can fail because they are poorly implemented. Behind this straightforward statement is a complex reality. 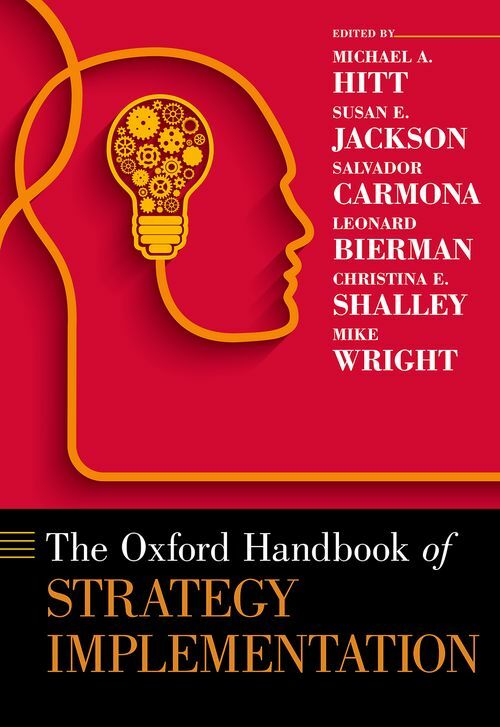 This innovative volume explores various aspects of strategy implementation, a process that is as challenging as it is important. For strategies to be implemented effectively, firms must have the right resources and capabilities available. Available resources must be integrated in ways that create the capabilities needed and then those capabilities must be leveraged to effectively implement the strategy in order to create and sustain a competitive advantage. This handbook focuses on how strategy implementation is influenced by resources and governance, human capital and management of it, and accounting-based control systems. It examines how the dynamic, competitive, and international environment increases the importance of knowledge and its acquisition, effective governance as a signal of proper incentives, the interaction of legality and legitimacy, and the connections between compliance and enforcement. Because people implement the strategies through the completion of their job tasks and achievement of their job-related goals, the second section explores how changes in workforce demographics have influenced and may influence strategy. Major factors include the greater proportion of older workers and the increasing role women play in leadership. Acquiring, developing, and having a motivated work force is critical to implementation, whether and how best practices spread is explored, as is the effectiveness of setting goals. Controlling managerial behavior plays a critical role in the implementation of strategies, and is the focus of the third section on accounting-based control systems. These can be helpful both in identifying inappropriate behaviors and in promoting positive managerial actions to achieve desired financial outcomes. They can also encourage experimentation and creativity. The effectiveness of accounting and accountability systems is influenced by four dimensions, including the intended users, standards of compliance, enforcement criteria, and the assurance process. Michael A. Hitt received his Ph.D. from the University of Colorado. He is a University Distinguished Professor Emeritus, at Texas A&M University and a Distinguished Research Fellow at Texas Christian University. He is a Fellow of the Academy of Management and of the Strategic Management Society and former President of both organizations. His research focuses on international strategy, orchestration of resources to create value and strategic entrepreneurship. ; Susan E. Jackson, PhD, is Distinguished Professor of Human Resource Management at the School of Management and Labor Relations. Her primary areas of expertise for teaching and scholarship include managing for environmental sustainability, work team diversity, and strategic human resource management systems. She has published more than 150 scholarly articles and chapters on these and related topics, and is the author or editor of several books, including her most recent book (with D. Ones and S. Dilchert), Managing Human Resources in Environmentally Sustainable Organizations, which examines how HRM practices are being shaped by business strategies aimed at improving their environmental performance records in response to increasing pressures from employees, customers, and investors. ; Salvador Carmona is a professor of Accounting and Management Control at IE University, where he currently serves as Rector. Salvador is the President of the European Accounting Association(2015-2017) and a former editor of European Accounting Review. He has conducted empirical research on the implementation of management accounting systems in high-tech firms as well as on the organizational and social aspects of management control systems. ; Leonard Bierman is a Professor of Management, Mays Business School, Texas A&M University. He teaches courses on the topics of negotiation/conflict resolution, business and government, labour relations/labour law, and employment regulation. His current research emphasis is in the areas of business and government and corporate governance. He is particularly interested in topics where these subject areas overlap, e.g., political activities/contributions by CEO's and other top executives and government regulation of corporate annual meetings/proxy voting. ; Christina E. Shalley is Thomas R. Williams-Wells Fargo Professor of Organizational Behavior at the Scheller College of Business, Georgia Institute of Technology. Her Ph.D. in Business Administration is from the University of Illinois, Urbana-Champaign. Her current research examines effects of social and contextual factors for individual and team creativity. ; Mike Wright is Professor of Entrepreneurship and Director of the Center for Management Buyout Research at Imperial College Business School and visiting professor at the University of Ghent. He is a co-editor of Strategic Entrepreneurship Journal, Academy of Management Perspectives and Foundations and Trends in Entrepreneurship. He is Chair of the Society for the Advancement of Management Studies and a Fellow of the British Academy.